If you have ever spent time around Web system administrators (or “sysadmins” as they prefer to be called) then you have probably been exposed to their arcane and often cryptic language. These people—who run the Web and e-mail servers that deliver content that makes the Web hum—routinely use expressions like “bash mod” and “cron job” and other such alien speech. Is it any wonder that few mere mortals are willing to delve into this enigmatic world to become the masters of their own Web servers? OpenOSX’s OpenWeb 3.0.2 seeks to change that for Macintosh users by taking some of the mystery out of UNIX command-line prompts and circumventing the cumbersome administrative setup process. It succeeds, for the most part, but has a few rough spots. The problems with setting up and running your own Web server are manifold. Beyond the physical (or wireless) connection to the Internet, there is the challenge of finding and installing all of the Web application components, packages, and libraries required to run a Web site. That can be a lengthy process. Once you find the software you need, you have to configure it properly, and then manage and maintain your Web site to make sure it’s running optimally. OpenWeb offers an easy solution to some of these problems. By enabling Web sharing in your System preferences, and then running OpenWeb, you automatically install a plethora of fully configured, open-source Web components and applications. In less than five minutes, your Web site is ready to be hosted directly from your computer. An assortment of other Web tools, including a search engine, online store, PDF generator, bulletin board, ad server, polls, and calendars. OpenWeb 3.0.2 features many different open source applications, so there’s no unified interface linking all the programs. Each of these programs is open-source software that was not created by OpenOSX, but by a variety of different organizations and individuals who make them available free of charge. So OpenOSX is not responsible for the individual components’ interface or documentation. 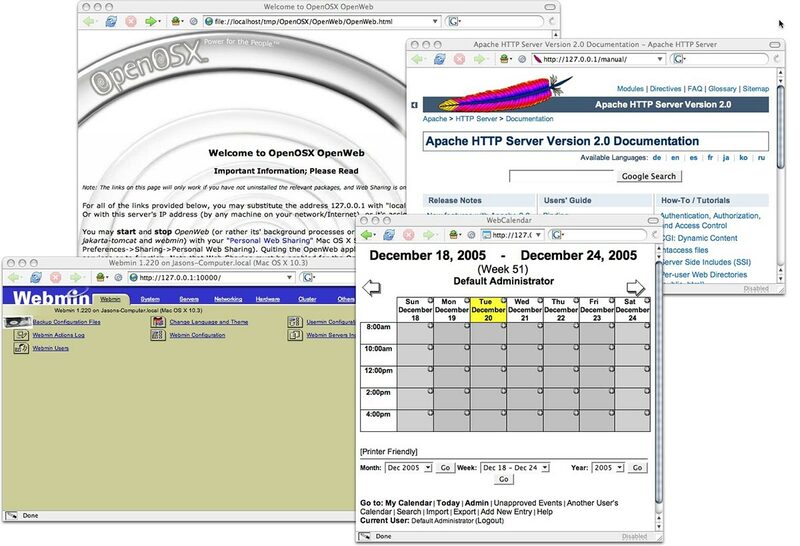 Unfortunately, after instillation, OpenWeb is not much help in getting you started with Web hosting. It does provide a launch page to navigate to the individual software components, but this is nothing more than a page of links with extremely technical descriptions of the software, which won’t help less technical Webmasters. OpenWeb installs all of the components at the same time, and although you can manually disable individual pieces by moving a particular directory out of the Web Documents folder, there’s no way to do this beforehand through the interface, and no way to tell which pieces are currently installed. What’s more, each of the numerous components has its own documentation written by its creator—not OpenOSX—so there is no consistency between OpenWeb apps. Instead, you have to wade through each application’s instructions and learn a new interface for each component you want to use. OpenOSX says it’s planning to develop an Aqua interface for version 3.1 (currently under development) that will allow you to control all of the components and settings from a single, unified screen. This could be a massive boon to would-be Webmasters. I eagerly await that version. Despite glaring typos in the documentation (the Reveal menu is referred to as the Launch menu), the installation process for OpenWeb is relatively foolproof. If you opt to purchase the OpenWeb CD Subscription ($140), you will also get six months of component updates at no extra charge. The advantage to users is that they do not have to monitor dozens of sites to find updated components: OpenWeb does it for them. 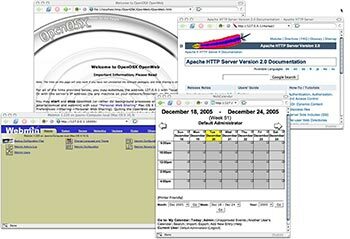 OpenWeb 3.0.2 is an invaluable time-saver for experienced sysadmins who want to get their Web servers up and running as quickly as possible. It’s also an excellent training tool for rookies who want to manage their own Web servers. However, once installed, OpenWeb provides very little added value over installing each application yourself.